John Warwick Montgomery | J.W. Wartick -"Always Have a Reason"
The quote is particularly poignant because it shows how even having what many consider raw data requires interpretation. One person can interpret evolution as confirmation of naturalism, while another might interpret it as teleology–goal orientation–found within the universe. Be sure to check out The Shape of the Past. It is a fascinating work. John Warwick Montgomery, The Shape of the Past (Eugene, OR: Wipf and Stock Publishers, 2008 edition [originally published 1975 by Bethany Fellowship]). Eclectic Theist– Check out my other blog for discussions about all kinds of topics including science fiction, history, fantasy movies, and more! 2015: The Year’s Best Books, My Reading, Blogs, and More! Another year has passed more quickly than I could have ever imagined. I’d like to share with you my reading for the year, as well as my awards for books, movies, and blogs. Please let me know about your own reading, movie-watching, and the like this year. I’d love to read about what you were up to last year and what books moved you or taught you much. The books of the year are based off my reading this year; not on whether they were actually released this year. The categories for InterVarsity Press (IVP) and Crossway, however, are from this year. Flame of Yahweh by Richard Davidson- This book is a massive wealth of information about sexuality in the Old Testament. Davidson analyzes an enormous number of texts to draw out the teaching on sexuality found therein. Davidson approaches the texts from what I would call a moderate egalitarian viewpoint, but he justifies this view directly from the text, with a particular emphasis on the creation account. Moreover, Davidson’s exposition of Song of Songs in particular is just phenomenal. I cannot recommend this book highly enough. The Shape of the Past by John Warwick Montgomery- this book is a historiography book–it is a study of how we write and study history, and it is phenomenal. John Warwick Montgomery is one of those rare people who can touch on seemingly endless topics from a clearly informed perspective, and draw them together with breathless beauty. The first half of the book offers a major look at various historiographic perspectives of the past. The second half is a collection of essays, each of which as informative and wonderful as the next. The book was published originally in 1975, but it remains as brilliant as it ever was. John Warwick Montgomery is just phenomenal, and this book was heavy, but breathtaking. Here’s a quote from the book. Rescuing the Gospel from the Cowboys by Richard Twiss- A convicting read, Richard Twiss argues that we have failed Native Americans when it comes to spreading the Gospel. The book is full of moving stories and deep insights. It is beautiful and haunting. If you want to know more, read my review. Newton on the Christian Life by Tony Reinke- John Newton is probably best known as the author of the hymn “Amazing Grace,” but Reinke highlights so much more about this amazing pastor in this interesting work. Read my review for more. The Once and Future King by T.H. White – I’m embarassed to say this, but I actually owned this book once and got rid of it because I figured I wouldn’t actually enjoy it. Was I ever wrong. I picked it up at the library and was absolutely blown away. This classic novel about King Arthur was everything I expected it to be and so much more. I was particularly impressed by the amount of genuinely hilarious humor found throughout. I did not expect the depth it had, either. It was fantastic. Okay, I did read Ben Hur by means of audiobook this year, but I read that book annually because it is probably my favorite work of fiction ever, so it’s not really fair to put it in competition. The New Jim Crow by Michelle Alexander- think racism is no longer a problem in America? Think again. This book has an enormous amount of research showing how our allegedly colorblind criminal justice system has perpetuated a system of injustice. Ghost Hawk by Susan Cooper- A haunting novel about the colonial period in the United States. It is rare that I am as emotionally moved by a novel as I was in this one. Brandon Sanderson seems to me a well that I will not stop returning to. Ever. I’ve not worked through his whole body of work yet, but everything I’ve read from him is amazing. He consistently nails stunning plot twists in believable ways. Thus, Calamity, the third book of “The Reckoners” is my most anticipated book for next year. I can’t wait to get my hands on it and find out what happens next. Star Wars: The Force Awakens- No, I’m not just saying this because it is Star Wars (though part of me is saying precisely that). I selected this one because it has so much in it to discuss. I’m not going to spoil anything here, so be sure to head on over to my post on the movie to read more. Christians for Biblical Equality– CBE continues to put out excellent articles week in and week out. Every new post is worth the time to read, and they have covered an enormous amount of ground with articles on neuroscience to articles on exegesis. This is a fantastic blog and well worth your time to read and subscribe to. The list starts at where I left off in 2014, when I first started keeping track. History is never fully objective. There can be objective facts of history, but our philosophies of life color how we organize those facts. Montgomery is careful to note that the process of writing history is selective in itself, and the way we organize it is another layer of interpretation. The Shape of the Past is a fascinating work that I am enjoying immensely. I recommend those interested in the important topic of historiography check it out for a look at how Christianity can make a contribution to the topic. The definition of inerrancy has been hotly disputed as of late. The infamous Geisler-Licona controversy, which continues to boil over at points, serves as a poignant example of this (see here for a Christianity Today article on the controversy; see also links below for a few discussions of the same). What is meant by inerrancy? Are we in a new era of Bible wars? These are the questions being asked right now. I remember reading an essay from a book–Faith Founded on Fact–by noted Christian apologist John Warwick Montgomery entitled “The Fuzzification of Inerrancy.” The quote above comes from the essay, and it has gotten me thinking. Have lines been crossed? Where do we draw the lines anyway? Montgomery defined “fuzzification” following James Boren. It is the “presentation of a matter in terms that permit adjustive interpretation” (217, cited below). Turning back to the quote above, the term speaks of the need to retain a specific idea essentially at all costs. Thus, when a challenge is raised to that idea, the idea is broadened or changed to incorporate the data raised by the challenge. Montgomery, originally writing in 1978, seems at times prophetic. He spoke of a time when one might see a contradiction, source theory, or even possibly an error in the Bible and simply define it as “a question of hermeneutics, not of inspiration at all!” (218); he worried about a time when “the ‘inerrancy’ with which one is left is an inerrancy devoid of meaningful content”; and he warned of the dangers of “adjustive interpretation” (227). I wonder, at times, whether his statements have come to fruition. When I survey various works from evangelicals on interpretation or hermeneutics I find a baffling array of ways we are to understand individual passages or how we are to interpret various passages. Turning to Church Fathers, I find a number of passages in which their readings would be unrecognizable today due to the heavy use of allegory in passages we take to be literal or explicitly historical in genre. Moreover, the question of the Chicago Statement on Biblical Inerrancy looms large. As with any document, questions are raised about what exactly is meant in each clause or in what way individual denials or affirmations might be meant. The question that will be immediately raised, of course, is “What does the Bible teach?” The overriding desire to restrict exactly what it is the Bible teaches and prevent so-called “liberal” scholarship from finding ground to stand on in evangelicalism has led to an incessant narrowing of the definition of inerrancy, such that clause after clause is piled one atop the other to the point that it is hard to operate within such limits. Moreover, it seems some of these definitions actually prevent development within theology and squelch the impulse to question received traditions in light of new evidence. The danger that some may think is posed by whittling the definition of inerrancy down to something like “The Bible is true in all that it teaches” may perhaps have some of the concern negated by the fact that it gets the dialogue going. If people return to this question: if someone genuinely, with open heart and mind, asks me “What does the Bible teach?” then I think that’s a glorious thing. Moreover, one may wonder at the purpose of inerrancy: is it a way to declare that the Bible is without error (as it seems to be based on the word itself); or is it a way to define how we go about reading the Bible? After all, if it is simply a declaration that the Bible is without error, should not simply declaring it as such be sufficient? Perhaps the danger of “fuzzification” from dehistoricizing texts, critical scholarship, and the like has in fact led to a fuzzification of the definition of inerrancy by making it over-determine the limits within which one may operate. I’m not claiming to offer all the answers, nor should it be thought that I am rejecting inerrancy. Far from it. ** What I am instead rejecting is a “fuzzification” of the doctrine: when did declaring the Bible to be God’s Word and Truth become so complex that volumes of books were necessary simply to define what that means? *This definition has suggested itself to me from a number of sources, including Nick Peters of Deeper Waters. **I’m sure some people will take any questioning of current discussion about inerrancy to be denying the doctrine. However, this post is clearly written in order to defend the doctrine. What does inerrancy mean? That’s the thrust of this post, not “Inerrancy is false.” I believe the Bible is true in all it teaches. 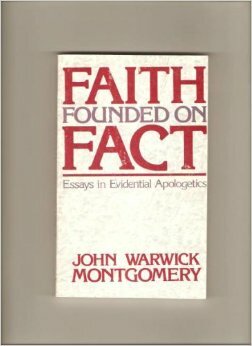 Book Review: “Faith Founded on Fact” by John Warwick Montgomery– I review Montgomery’s well-known book on apologetic methodology. The Geisler/Licona Debate– Nick Peters has a number of posts on this controversy if you want to read up on the topic. This post summarizes the debate and offers a thoughtful critique, in my opinion. The Geisler/Licona Controversy– A quick, easy read on the reasoning behind the controversy. Montgomery began by discussing the possibility of a position which had so much evidence that it becomes difficult to not believe it. Despite this, people do not hold that position. The reason, he argued, is because reasons other than evidence play into one’s conversion. Moreover, we live in a pluralistic age, which means that there are a vast array of options available to people looking for a worldview. This pluralism necessitates a drop in conversion rates because there are more worldviews presenting their evidence to each individual. Thus, it is important to look into the issue of the burden of proof alongside the issue of the standard of proof. But it is important to note that the burden of proof is not the same thing as a standard of proof. When people object to Christianity based upon a supposed lack of proof, they are not addressing the burden of proof but rather the standard. Montgomery acknowledged that Christianity must assume the burden of proof but makes several points related to the standard of proof. First, proof “depends on probability–not on absolute certainty or on mere possibility” (Montgomery, 452, cited below). He appealed to the “Federal Rules of Evidence” to make this clear. The key is to note that probability ,not absolute certainty, is at stake. Why? Epistemologically speaking, absolute certainty can only be set out in formal logic or mathematics. It is unjustifiable to require absolute certainty for every fact. “Where matters of fact are concerned–as in legal disputes, but also in the religious assertions of historic Christianity–claims can be vindicated only by way of evidential probability” (Ibid). Second, and more importantly for the current discussion, there are differing standards of proof. The legal system is again a model for this notion. In criminal trials, there is a higher standard of proof than for civil matters. The criminal standard is beyond reasonable doubt, while the civil standard is “preponderence of evidence.” Montgomery argued that religious conversion should be seen as bearing a standard of proof “beyond a reasonable doubt” (453). Third, competing religious claims must each assume their own burden of proof. They cannot simply say “prove my religious claim false.” One must meet the standard of proof in order to have legitimate entry into the competition between worldviews. Extraordinary Claims Need Extraordinary Evidence? Often, the claim is made that religious claims, because they are extraordinary, need extraordinary evidence. I have written on this exact topic at length elsewhere, but here will focus on Montgomery’s argument. He argued “The notion that the ‘subject matter’ should be allowed to cause a relaxation or an augmentation of the standard of proof is a very dangerous idea…. No one would rationally agree to a sliding evidence scale dependent on the monetary sum involved [in a crime]–nor should such a scale be created… The application to religious arguments based on the factuality of historical events should be obvious. Of course, the resurrection of Christ is of immensely more significance than Caesar’s crossing of the Rubicon, but the standards required to show that the one occurred are no different from those employed in establishing the other” (Ibid, 455-456). The notion that the import of a claim makes a sliding scale of evidence is made to be absurd because historical events have more importance across cultures and so would, on such a view, be radically different in their acceptable standards of proof. Finally, Montgomery focused on the existential side of conversion. Here, he offered what he admitted as a somewhat crude argument which was derived from Pascal’s wager. Assuming that the standard of proof is met for a religious system, one still must deal with the existential factors of conversion. Thus, Montgomery argued, one’s commitment to a truth claim should be weighed by the benefits divided by the entrance requirements: C=B/E. Because the entrance requirements for Christianity are extremely low, and its benefits infinite, one should, assuming the standard of proof has been met, be highly committed to Christianity. Montgomery noted that some may argue the entrance requirements are very high (i.e. setting aside adulterous relationships). Against this, Montgomery argued that the benefits vastly outweigh the finite bliss one feels by such sinful actions. The subtlety of Montgomery’s argument should not be missed. It has application in a number of areas. First, Montgomery is as thoroughgoing an evidentialist as they come. His argument about the standard of proof being probabilistic is unlikely to gain much credence among those who favor a presuppositional approach to apologetics. Yet it seems to me that Montgomery’s argument in this regard is correct. We must take into account the evidence when we are looking at various religious claims, and also acknowledge the existential factors which play into conversion. Montgomery’s argument does much to clarify the issue for apologists in general. Our task is to clear barriers and present convincing evidence to those who argue that Christianity has not met the standard of proof. But our task does not end with that; we must also present the existential challenge of Christianity to those who believe the standard of proof has been met. This includes the preaching of the Gospel. Montgomery was also careful not to discount the Holy Spirit in religious conversion. He made it clear that he was speaking to the notion of conversion in the abstract. People must be renewed by the Holy Spirit; yet that renewal may come through evidence and standard of proof. It seems to me that Montgomery’s arguments were insightful and sound. He presented an excellent way to look at religious claims and evaluate them in light of evidence, while also taking existential factors into account. Montgomery’s use of evidence in law to look at religious truth claims reminds me very much of J. Warner Wallace’s Cold Case Christianity. Check out my review of that fantastic book. Extraordinary Claims need… what, exactly?– I argue that the claim that religious claims need extraordinary evidence is mistaken. Gregg Davidson vs. Andrew Snelling on the Age of the Earth– I write about a debate I attended on the age of the earth. Caring for Creation: A dialogue among evangelicals– I discuss a lecture and panel discussion on caring for the environment. Genetics and Bioethics: Enhancement or Therapy?– Here, I outline a fascinating talk I attended about gene enhancement and gene therapy. You can read my overview of every single talk I attended: My Trip to the Evangelical Philosophical/Theological Society Conference 2012. John Warwick Montgomery, “How Much Evidence to Justify Religious Conversion?” in Philosophia Christi 13, #1 2011, 449-460. 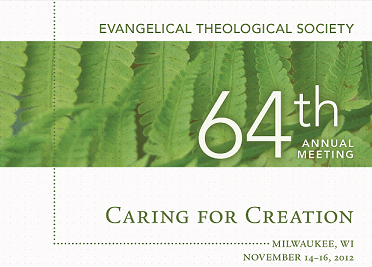 Last weekend I had the supreme pleasure of attending the 64th annual meeting of the Evangelical Theological Society and the Evangelical Philosophical Society (there’s a mouthful!). I took over 80 pages of notes (43 front/back) and enjoyed the entire time immensely. I’ll be posting in the upcoming weeks and months on a number of these topics, so for now I’m just going to very briefly outline the talks I went to and give one or two comments each. I encourage readers to browse through these and let me know which ones they’d be interested on me writing on in a bit more depth. Feel free to ask questions as well. Readers know that I am very interested in the controversy among Christians over the age of the earth. I’ve written quite a bit on the topic. This session featured Gregg Davidson (University of Mississippi), a geologist, facing off against Andrew Snelling of Answers in Genesis. I have to admit that I was surprised by how much this debate focused on the science. Specifically, Davidson presented two very thorough evidences for an old earth, while Snelling rebutted these and argued that a catastrophic interpretation was perfectly consistent with the record. It was a fascinating back-and-forth. You can read an extended outline/review of this talk in my post: Gregg Davidson vs. Andrew Snelling on the Age of the Earth. Gary Alkin(? his name wasn’t in my program) presented a paper on genetic enhancement and whether it is morally permissible. Essentially, his argument was that while as Christians we are obligated to heal diseases and help others, we are not obligated to try to become superhuman, and indeed are perhaps prohibited from doing so. He countered numerous arguments for the notion that we should continue to try to ‘enhance’ humanity. It was an interesting paper. I have since written an extended examination of his paper here: Genetics and Bioethics: Enhancement or Therapy? Thomas Provenzola presented a mind-stretching paper on how Tolkien’s use of myth helps us to think about care for creation. It was a fascinating look into philosophy and literature. Rob Lister of Talbot School of Theology presented a paper in which he argued that we must understand language about God both literally and analogically. He argued that open theists often err too far towards creating an anthropocentric concept of God, rather than understanding passages about God’s repentance in light of clear statements about His being. I was so fascinated by this talk that I went and got his book on the topic afterwards. I look forward to reading it. Kevin Giles (Victoria, Australia), Steve Tracy (University of New Brunswick), Mimi Haddad (Christians for Biblical Equality), and David Malick (CBE) participated in a panel discussion on the evangelical statement on the Trinity. I was surprised to see how contentious this talk was, but unfortunately there are people who are undermining the Trinity by eternally subordinating GOD the Son. This discussion went beyond an egalitarian/complementarian debate and essentially touched on how we must not distort the Trinity for our own purposes. N.T. Wright, who needs no introduction, presented a paper arguing that the cosmic language used for the destruction of the temple is not so much due to an end of the space-time universe as it is because the Temple was the center of the universe for Judaism. Kevin Giles presented a paper arguing that orthodoxy on the Trinity does not subordinate the persons. Rather, the distinctions made between persons according to the orthodox faith are made according to generation (the Son is begotten by the Father, and the Spirit proceeds from the Father and Son). He stressed the importance of drawing implications of the Trinity from the Godhead and not from humanity. David cogently argued that we can look at the narratives in the Gospels to see what Jesus’ view of women was. Because we can see with clarity how Jesus elevated women’s roles to that of equal to men, he argued that we should interpret hard passages in light of the clearer passages. This paper was very clearly argued and extremely compelling. I hope more work is done in this area, because the argument was very tight, and there is much development to come from it. Complementarians, Egalitarians, and Unicorns: What are they, and do they exist? Walker argued that the categories we are using to identify people in the gender debate reflect a genus/species fallacy which essentially drains them of all meaning. It may be helpful to develop new terms to make the distinctions more clear. I must confess that I only went to this one because there weren’t any others going on. I’m very pleased I did, because this plenary talk proved to be one of the most interesting discussions that I attended. Moo argued decisively that we must not cause Christianity to lose credence due to clinging to faulty science. Furthermore, he argued that it is our duty to take care of creation. He traced an interpretive strategy through Scripture and argued very convincingly for the use of the hermeneutic he was pressing for looking at Christianity and the environment. I wrote an extended post on this paper and the following panel discussion: Caring for Creation: A dialogue among evangelicals. Following Moo’s plenary talk, there was a panel discussion with Moo, E. Calvin Beisner, Russell Moore, and Richard Bauckham. This panel discussion was highly contentious and the audience clapped for their favored party numerous times. Beisner seemed to be the odd man out, as he did not deny climate change, but rather argued that we don’t yet know conclusively that it is anthropogenic (caused by humans). The other panelists argued that the science is convincing and that we do cause people to look with wariness upon Christianity. It was a very invigorating debate. Ryan West presented a paper arguing that many of the arguments raised against substance dualism are essentially faulty once one grants theism. He further argued that naturalistic dualists (of which there are few!) would be better off embracing theism, for their view is in extreme tension given the arguments he presented. It was a brief paper that was very well argued. The Q+A was great. The great apologist John Warwick Montgomery presented his paper on religious conversion. Essentially, the argument was that given certain benefits and a low price of commitment, people should commit to Christianity assuming the standard of proof has been carried. It was a fascinating paper, and Montgomery’s presentation style was both engaging and endearing. It was a huge pleasure to get a chance to talk to him briefly after the talk. I’m not very interested in Rand, but this paper by David Kotter was interesting enough to get me interested in the topic. He noted both good and bad portions of Ayn Rand’s philosophy and argued that ultimately, her perfect man has come to fulfillment in Christ. He presented a critique of a number of her views, while arguing that some things are worth looking at for Christians and the government. A truly engaging paper. Throughout the conference I had numerous pleasures of running into fellow bloggers, friends, and huge names in philosophy and theology. I enjoyed lunch with Matt over at Well Spent Journey and stayed with Kurt over at Real Clear Apologetics. I was so delighted to meet Holly Ordway from Hieropraxis and engage with her in some great discussion. Other examples include running into Hugh Ross from Reasons to Believe, socializing with William Lane Craig, however briefly, and bumping into numerous others (Jerry Walls, David Baggett, Nabeel Qureshi, and more). I also enjoyed interacting more with David Malick of CBE. What a blast!